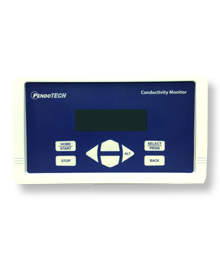 PendoTECH’s Single-Use Conductivity Sensors™ and Conductivity Monitor integrate for highly accurate conductivity and temperature measurements without the need for sensor calibration. All sensors have a pre-determined cell constant which is entered into the monitor. For use in critical bioprocess operations, the sensor monitor reads conductivity and temperature for two sensors. The monitor has an mS/cm temperature adjustment that normalizes conductivity readings to 25°C. The monitor has 4 – 20mA outputs for both conductivity and temperature and an RS232 output for data collection to a PC.